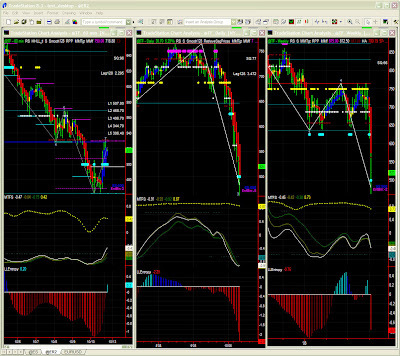 Market Direction(daily): Short with tighter stops now. Nothing wrong with staying cautiously away until the end of the storm though. Last week's report (monday pre-market) wasn't far off the mark and while we were hoping for a bottom, we knew the hemmorhage was still there and we saw more more blood gushing out in an almost panic situation. The concerns are valid, but markets are clearly overreacting now. We do need time to evaluate damages to the real economy while investors come back to their senses. The spreading outside America has been blown out of proportions and we will realise shortly that the crisis can be contained to an extent, particularly if consumer demand in emerging markets picks up (excess) consumption given up by cash-stricken Americans. Overall the economic situation may be not as bad as it looks now, even if the political cost for America and the western world in general will be ENORMOUS. Don't read me wrong: this is still by far the worst crisis since 1929 ! There will be a before and an after October 2008 in history books !!! EURUSD: I obviously underestimated volatility and my target was way too shy. EURUSD is absolutely ready for a radical bounce and yet we don't see clearly which level would be strong enough to it. Do we have to lose more ground? That does seem quite logical indeed so lows could be tested again. Short sellers must just be careful of the coming reversal and should therefore follow shorter time frames. OK, we've had a reassuring end of week bounce, but can we start buying? On short time frames, we're long already with due consideration it is still a contrarian trade. 500 should be tested for support to go higher, so one should not expect volatility to come down too quickly. We'll watch the first Fib level and a possible channel break to reinforce a long position. ER Daily: still down, but congestion is likely now. Those who followed my advice to go short last week were right. The support levels broke one after the other, yet is it different now? 500 hasn't been broken technically even if stretched to the limit by current volatility levels. We are however no way near a recovery situation, but in "hangover" mode at best. Any bout of selling can still send ER much lower. Having said that a few days with ER hovering around 500 would be good enough to signal a trough on Entropy and may calm down our MTFS green line. As always, we'll keep an eye at the shape of our MTFS crossover to validate a turning point. Again current volatility acts as a time compression factor so can make this scenario happen any time from the 1st hour of trading on monday to maybe wednesday or thursday. ER Weekly: this is a market crash, and this time frame is obviously completely out of synch.